Thirty-two years ago today, October 3, 1980, at Ceasars Palace in Las Vegas, Nevada, one of the worst events in the history of boxing took place – Muhammad Ali vs Larry Holmes. Younger, stronger, and in his prime, the 31 year old Larry Holmes (35-0), the WBC Heavyweight Champion, was matched up against an old, shopwarn Muhammad Ali (56-4) who was likely in the early stages of Parkinson's Disease, a disorder of the brain that slows one's reflexes and eventually leads to shaking (tremors) and difficulty with walking, movement, and coordination. Muhammad Ali was a little off when he tried to touch his finger to his nose. The fight legend couldn't hop on one foot well. Despite the poor results, Nevada approved the fight with Holmes. knockdowns, but Holmes dominated the fight and was given every round by all three judges. Finally, Ali's corner stopped the fight after the tenth round. The TKO marked the first and only time Ali was stopped inside the distance in his 61 fight pro career. Holmes entered the bout having made seven successful title defenses since winning the WBC strap in a brusing 15 round affair with Ken Norton in 1978. Still, even with the success, a shadow still casted over the great champion… And that shadow's name was Muhammad Ali. It's hard to follow in the footsteps of a legend and boxing is no different. Moreover, it's also difficult for a legend's endearing fans to come to grips with reality that their icon just doesn't have it anymore. Think Johnny Unitas starting for the San Diego Chargers, Hakeem Olajuwon as a Raptor, or Wayne Gretzky as a Ranger. People still believed Ali was truly 'The Greatest,' as did the media. During this period, sports magazines, specifically Sports Illustrated, had Ali's face on it, calling out the champion. But Muhammad Ali, who even then was widely considered one of the all time great boxers and icons of the sport, had been retired from boxing for two years and had absolutely no business being in the ring, let alone fighting boxing's best heavyweight. But the media, fans and the general public never really wanted to acknowledge Larry as a true champion and believed the great Ali would orchestrate one last hurrah. Sadly, people around Ali seemingly didn't have the sense or courage to talk him out of a ring return. And Ali, despite his withering reflexes and slurred speech, truly believed he could win the fight – But the evidence was clear he had nothing left and couldn't come remotely close to beating Holmes on the champion's worst day. Holmes, who insisted after the fight that he held back, still unleashed savagery in spurts and pleaded with the ref in Round 9 to stop the fight. After Holmes won the fight, he sat crying in his locker room. Perhaps he realized he should of never taken part in the fight. Although he quieted the echoes of Ali, he'd beaten up an international hero whom he served as a sparring partner for years prior. Pacheco, also Muhammad Ali's long time friend and confidant had asked Ali to call it quits five years prior following the “Thrilla in Manila” in 1975. Ali's reluctance to retire forced Pacheco to leave Ali's camp in 1977 or morals grounds, refusing to take part in what be believed would be Ali's ultimate undoing. Perhaps Ferdie Pacheco was prophetic? Today, we look at our great champion in the state that he is in today and have to look back and wonder if Ali vs Holmes contributed to diminished state as its likely Muhammad Ali was already in the early stages of Parkinson's several years before the bout. How Muhammad Ali, seemingly suffering from the onset of Parkinson's, was able to defeat top fighters in the latter stages of his career is a testament to Ali's greatness. But win or lose, the signs of the debilitating disease were certainly evident. So, who is to blame for this charade? Angelo Dundee: Ali's longtime trainer of 15+ years had to have known Ali was shot. And he may of been the only person who could of put a stop to the madness that ensued. What drove Dundee to even taking part in this fight? One things comes to mind, if not Dundee, somebody would have taken over trainer duties, right? Maybe Angelo knew this and thought he could be the only one to stop it when it needed to be stopped. Perhaps, he just wanted to be there, but nevertheless he let it go on far too long. However it did not do him any favors in the process. Nevada Athletic Commission: How was Ali sanctioned to fight? What the commission did was almost criminal, especially given Ali's poor neurological test results. Licensing Ali to fight in his poor state was an utter embarrassment and one of the worst decisions in the history of not just boxing, but professional sports. Muhammad Ali: It's really hard to blame Ali in this situation. He was one of the greatest of all-time. He'd beaten the best all of his adult life, in the amateurs and pros. It's difficult for great old legends with big egos to realize they don't have it anymore. And who among his friends, aside from Pacheco, would have dared tell the legend his time as a fighter had past. Despite Ali's sluggishness in training, slurred speech and broken down appearance, his entourage continued to praise him and bolster his ego as they had in years past. Why did Ali vs Holmes happen? Perhaps the answer is simple. Ali's purse was $8 million, while Holmes earned $2.3 million. And keep in mind, this fight was in 1980. For the same fight today, Muhammad Ali would have earned $23.Million USD while the champion 6.7 Million USD. So perhaps the public is to blame? After all, public demand generated the enormous sums of revenue the fight garnered. As sports fans, we often puts our athletes on a pedestal, never wanting to see great old performers exit the stage. Perhaps this event taught sports fans a great and valuable lesson: Everyone, even the great ones, can't be on top forever. 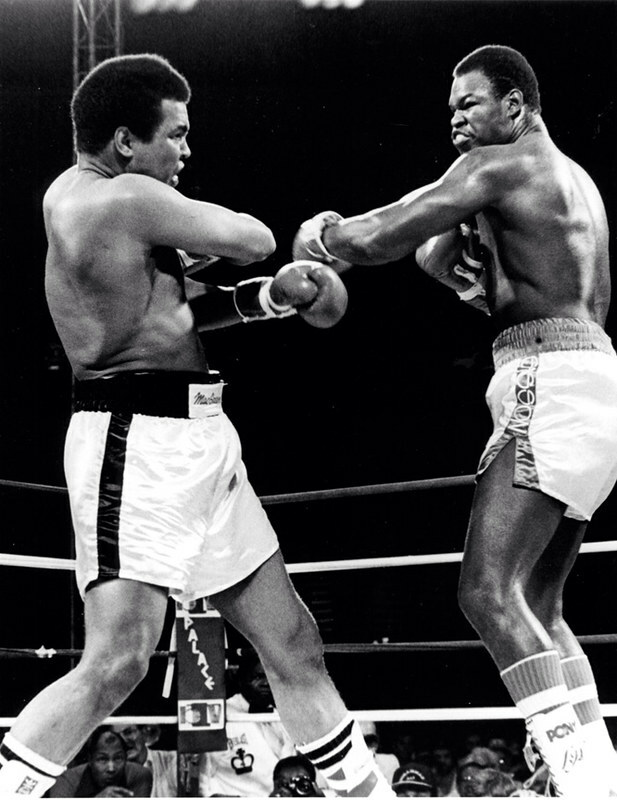 Muhammad Ali vs Larry Holmes was one of the great tragedies to ever take place in sports. Nobody wants to see their heroes fall, especially in such a demoralizing manner. So why put them there in the first place? Ali was planning to face John Tate for the WBA title, but Tate lost the title to Mike Weaver. Ali then set his sights on Weaver, but Ali said negotiations for a fight against Weaver fell through when promoter Bob Arum made last-minute financial demands. Caesars Palace constructed a temporary 24,790-seat outdoor arena for the fight. The live gate was $6 million, a record for that time. Unbelievably, Muhammad Ali would fight one more time, losing a 10 round unanimous decision to upstart Trevor Berbick in 1981.